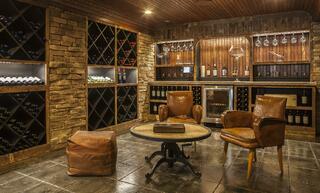 A home wine cellar is a great way to utilize many basements. The Wine Spectator recommends a temperature between 45° F and 65° F with 55° F almost perfect. Most basements will be a consistent temperature in this overall range, which is very important; extreme fluctuations in temperature can harm wines but a stable temperature will treat them gently.